Lady Alda Hoare of Stourhead took great care of recuperating soldiers from nearby Mere Hospital, opening her home to them for weekend visits and letting them ride her motor car. She kept a diary, and the entries show her great empathy for the plight of battle-weary soldiers. However, her own suffering became intensely personal with the loss of her only son, Harry, who died of wounds in hospital in Alexandria, Egypt, on Dec 19th 1917. Harry Hoare fought with the Dorset Yeomanry in France, Gallipoli and Palestine and rose to the rank of Captain. Injured in the Gallipoli region of the Dardanelles in early 1916, he was sent home to Stourhead to recuperate, later rejoining his regiment. In November 1917, he was leading an attack at Mughair Ridge in Palestine when he was fatally wounded. Evacuated to Egypt he died in hospital, aged 29. Excerpts from Lady Alda Hoare’s diary 1916-?? Saturday September 23rd 1916. At 2.20, a party of 26 soldiers (not 40 as expected, the rest being not well enough,) arrived. Mrs Neville, of Knoyle Vicarage, in charge. They boated & fished, & caught 126 fine perch in the Flora-Bay, & one very large trout. Henry photo’d them all, & me, & Mr Rycroft – the ‘Tommy’, catcher of the big trout holding it up, in foreground, at my suggestion. We had tea in the Museum at 5 o’clock – I, pouring out tea at one table, & Mrs Neville at another. After tea, & after we had left them to a good smoke, they all came up into the Hall, & signed the Visitors-Book – this, at suggestion of a ‘Tommy’ who’d signed it here before; they love doing that. Then they went round the rooms, & pictures. They left at 6.20, though we asked them to stay on, for billiards and music. But they are not allowed out after 6.30. The Sergeant-Major on my right at tea told me he’d ‘never had a finer tea in his life’ – (it was rather a nice one) – & many of the men told us later they’d had the happiest times, at Stourhead, of all their times, since they returned from the French-front. Poor fellows, poor fellows, poor gallant fellows all. Monday January 8th 1917…My dear Tommies “teas” they so “enthuse” about! Comprise to start with – hot collops (one each – made of remains of game and cheese & mashed & curried potatoes); bread & butter; currant-cake; currant-buns (always hot & sometimes split & buttered); honey; & heaps of sandwiches, made with butter & thick layers of potted ham & any tiny remains of other game; & apples to wind up with; & very strong tea – & they are allowed to send down if needed for more & more of those beloved meat-sandwiches until they can eat no more – “I couldn’t eat more”, said one, Saturday, to me; “I couldn’t if I tried & it’ll be no use my being [at the] Hospital for supper, cause I can’ eat none, I’ve had a fair tightener for me tea, my lady”. “The boys do love your game-sandwiches, my lady!” said another “Tommy” to me – yet with careful management I do above teas, milk, sugar, tea, flour, butter, lard, and every tiniest item included for 4 ½ (d) p. head. The honey & game are the only items I get gratis. Sunday Dec 31st….A long wet afternoon – I spent it South-Room writing New Year letters 2 to 7.30 – To Col. Byng; my favourite ‘Tommy’ Private Morris, & others. Saturday Oct. 21st…..At 2.20, 12 Tommies came – Seven fished, getting 97 – The others asked to go all round the Grounds, & up to the ‘Sun Temple’ with me where we rested – Then we joined the fishing party – & some went on up to Gardens and House – My nice Tommy, Morris, in the Guards, stayed with me all afternoon – & told me of his mother, & his favourite officers, & showed me their likenesses – Poor fellows; poor fellows – At 5 they had tea; big dining room – Then music in Music-Room till 7.30 – one elderly, old Tommy, the Hospital’s ‘Funny man’, for 4 months, looked so miserable I got him apart – & we are to correspond & I to (send a) tuck-box – They none of them wanted to go tonight – He told Henry he’d like to sleep here jokingly; but Henry even noticed his depression – He grasped both our hands, on leaving; & shouted back Good night when half down the drive – (Poor fellow he’s going to France, for 3rd time; leaving wife and child) So I shouted back the same. Saturday Nov. 4th….On stroke of 2 my Saturday’s party of 12 ‘Tommies’ came, with ‘Head-Sister’ – Those who had not yet, went round house, alone – conducted by a man who had – Then, I showed the just-come football(!) to Morris; the nice young ‘Tommy’, in Guards – All the men delighted with it – Our whole party went out & ‘started’ the 9, who ‘wished to play’, in West Park; (towards right of white gate, leading across Park, to Terrace Lodge) – Then leaving them I took 3 others, & ‘Sister’, who wished to fish, to the ‘Flora Bay’ – But, today, no fish were caught owing to intense rain of yesterday – Then, I took ‘Sister’ round Grounds – & our fishing party re-entered Hall, 4.20; finding the footballers all smoking, in a big circle, round the cheery Hall-fire – Then, I showed ‘Sister’, & 4 or 5, who wished to re-come, round all rooms – At 5, tea for ‘Tommies’, in big dining room ‘Colonnade’ – From 6 to 7.15 music and Tommies singing in Music-Room I playing – Morris (my best singer;) Staples: (also in Guards & many more of my ‘habitués’ leave Tuesday – & soon, alas! Back; (Morris for 3rd time;) to French trenches – Like Hinchcliffe; Walkden; Kieley; & other, of my favourites, (poor men;) Morris seemed very low, at going tonight – He told the nice ‘Sister’, ‘he didn’t want to leave Mere’ – but is ordered to finish convalesce at Epsom; ‘where he does not want to go’ – The ‘Sister’ told Henry, and Sybil, that my ‘Tommies’ simply love coming here – & that they had told her, ‘Tommies’ in other hospitals, round here, had told them, ‘they were lucky to be at Mere, & to have got me (! ), ‘as no one does for Tommies in these parts, what I do – no one does aught for them – And the ‘Sister’ told Henry, & Sybil, I meant ‘such a lot to them; & they, one, and all, so looked forward to, and just loved, coming here’ – I was glad – I gave Morris, & Staples, my usual 5/- on parting – (that, I give, quietly, to a good few on parting- I only wish it would ‘run’ to giving it them all_ – A hideous hurricane started at 6 pm – & lasted till 6 am. My Tommies left at 7.15 pm. 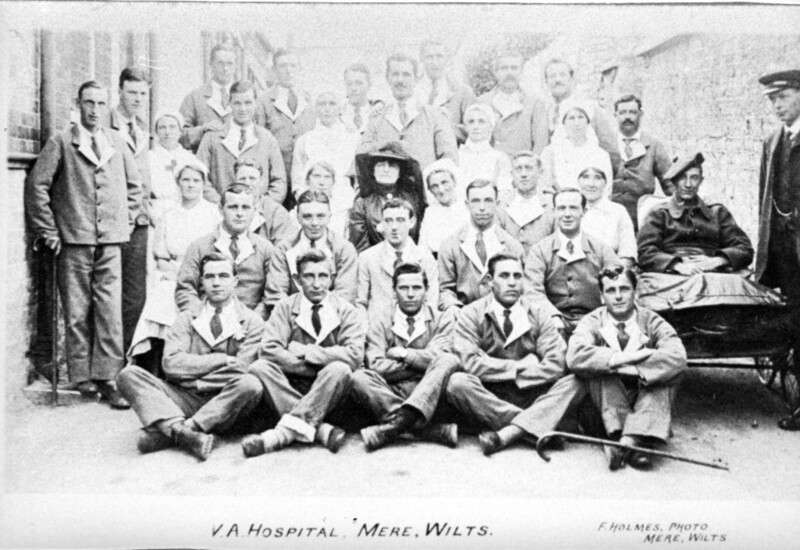 The hospital in Mere closed on February 28th 1919. 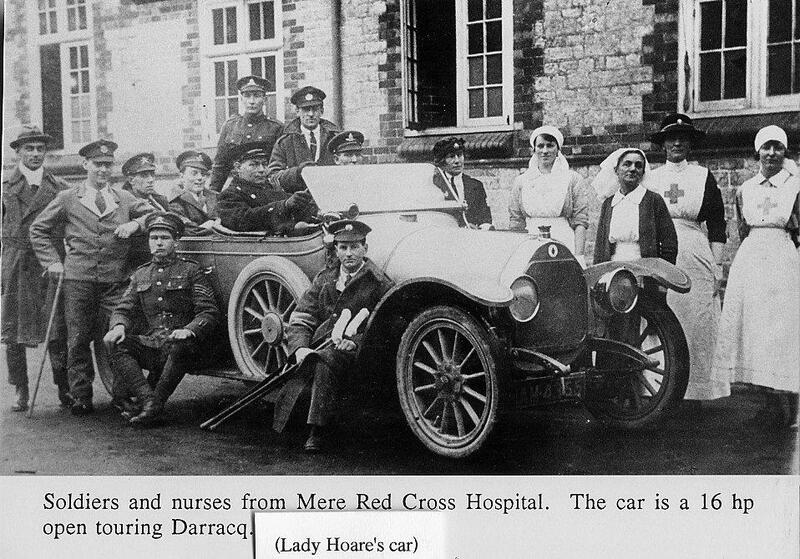 Soldiers and nurses outside Mere Hospital with Lady Hoare’s motor car. This story was donated by Mere Museum. I am afraid it is very unlikely to be Lady Alda Hoare, as she married Sir Henry Hoare in the 1800s, so would not have been a ‘Miss’. I also do not believe she was a ragtime singer (though she did sing and enjoy her music). I will get in contact with Mere Museum, who supplied this story, next week to double check, and will get back to you as soon as they reply. I have been in touch with Mere Museum, and Jenny, who kindly responded for them, confirmed that Lady Alda Hoare was not a rag-time singer. It would have been a great link if she had been, so that’s a shame. I hope you manage to identify her.